Want Data Sovereignty + Regional Regulation Peace of Mind? Our customers have always valued Zimbra’s security and privacy features. Now we are finding that more and more of our customers are choosing Zimbra for data sovereignty. Simply explained, data sovereignty means that your data resides in your country (either or on your own servers or in a private, in-country cloud) and is subject to your country’s data privacy laws and regulations. Today, the majority of the world’s email is dominated by just a few vendors, and much of that email lives on the vendors’ mail servers. This makes data sovereignty a great concern for many countries and organizations (enterprises, governments, etc.). Regional regulations are becoming the norm. In 2018, Europe introduced GDPR (General Data Protection Regulation), which increases the protection of personal data for people who live in the EU. Argentina, Finland, South Korea, Indonesia and many other countries also have stringent personal data protection regulations. … and more countries are joining the list every month. And if regions and countries are not enacting specific regulations, organizations are self-protecting with stronger privacy requirements. Government customers especially have a growing list of data protection needs. Zimbra has been focused on data privacy since our 2003 inception. It’s in our DNA. Zimbra was built on the premise that YOU own your data, and YOU have full control over data accessibility and storage. Unlike some email solutions, Zimbra does not share customer data across country borders. It allows customers to store data using in-region clouds or on-premises servers, with security standards that are right for their business. How does Zimbra satisfy regional regulations and data sovereignty concerns? On-premises or Private, In-Country Cloud. Zimbra offers multiple ways to install and run your email. With either choice, your data is subject to your country’s data privacy laws. Zimbra Open Source Edition. We are the only major email provider who offers a free, open source software (FOSS) version. This means our code is available for code audits, a requirement of many governments. No Data Sharing. Zimbra does not share any customer data with anyone. “Our clients … want to retain their sovereign right to their online data and want to “resign” from the continually watching, analytical multinational tech companies and institutions. In addition to Zimbra’s privacy and security, we chose Zimbra because of their excellent web client, their exchange protocol under Linux and their great support,” said Borsos Gábor, CEO COREX (Hungary). Read more. Zimbra provides a considerable economic saving compared to other cloud-based email systems, while maintaining the same features and guarantees in terms of privacy, security and data sovereignty. We love the user-friendly Zimbra Web Client and the extensibility of Zimbra that is possible with Zimlets and third-party integrations, such as Nextcloud,” said Franco Bolzonella Account Manager at Policlinico Abano (Italy). Read more. If you want to learn more about Zimbra and the peace of mind we offer, contact us at marekting-team@synacor.com. Happily leading Zimbra Training for over 9 years! 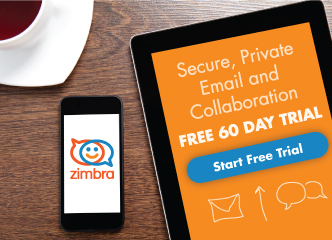 Power Tip Tuesday – Save Time w/ Zimbra Mini Calendar!